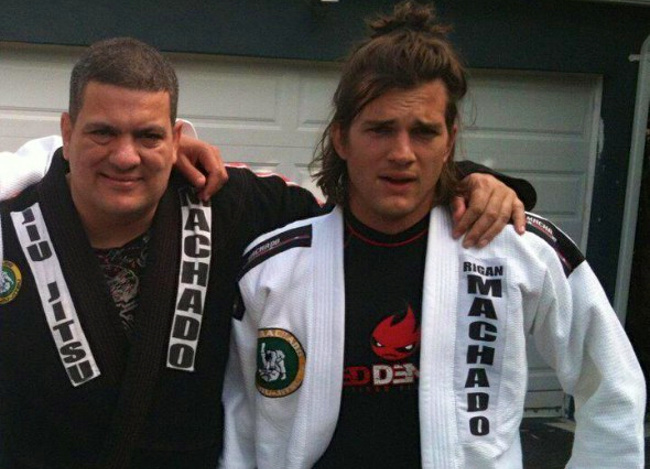 If you didn’t know, Ashton Kutcher started training Brazilian jiu jitsu a couple of years ago, and earned his blue belt under Rigan Machado earlier this year, in February. Rigan Machado, and eighth-degree red-and-black belt, and one of five Machado brothers, began training with the Gracies when he was five. He earned his rank under Carlinhos Gracie, and interestingly, holds a win over Ron Tripp, who is the only person credited with an official win over Rickson Gracie. Yesterday, Machado posted a photo to his Facebook page of him and Ashton Kutcher, both of them in their gis. Kutcher’s belt, however, is now purple. Well done, Ashton. Kutcher—who is a fan of mixed martial arts fan, goes to the UFC’s events, goes to wrestling events, is a wrestler himself and has even rolled with Cub Swanson—is a huge fight nerd like us. He’s also one of the latest celebrities to get into the Gentle Art. Maybe you didn’t know, but Paul Walker—rest in peace—was in love with Brazilian jiu jitsu. It was almost as if the sport had been tailored for the actor: legend says that growing up and getting into fights, Walker would fight from the bottom position. Modern Family’s Ed O’Neill is also an ambassador of the sport, training under the Gracie banner for many years and doning a black belt from Rorion Gracie, the creator of the UFC. You can almost always catch him front-row at Metamoris. And let's not forget Anthony Bourdain, whose wife started him out on small does, but has become a full-blown jiu jitsu addict. It's not a big deal to see celebrities training nowadays. But most of the time you will see them boxing. Hitting a heavy bag and doing pad work is great, but it takes a certain kind of person to put on the gi. Training the grappling arts is a lot more up-close-and-personal. You get bruises and abbrasions on your neck. Your knuckles feel arthritic holding onto the rough fabric for hours at a time. Much love to Jessica Alba for being into fighting, but let's face it, she's not going to want to escape the mount for an hour. Boxing is important, don't get us wrong, but it takes a different kind of person to be OK with grappling. So, shouts out to Ashton, for mixing it up and getting your hands dirty on the mat!